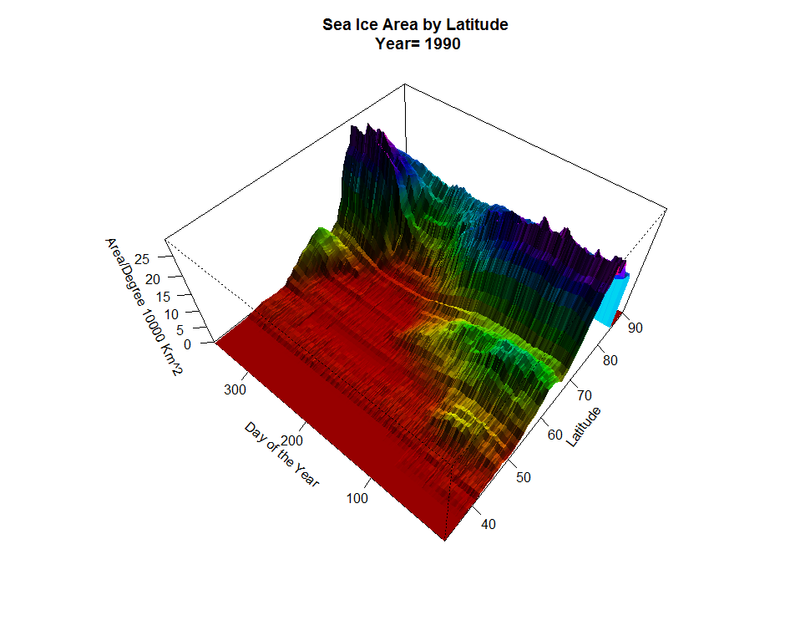 As regular readers know, we have been using daily gridded sea ice data from satellite microwave sounders published by the NSIDC to discover what we can learn both from and about the data. With Layman Lurker’s help we recently discovered that nearly 100% of the sea ice to the South of 72 degrees North latitude and the equator has melted every year since satellite records started. Since the Antarctic sea ice is known to melt annually as well, we can say that nearly all of the sea ice south outside of 18 degrees from the North pole vanishes every single year. Figure 1 below takes a moment to interpret, but is interesting in that it shows the loss and recovery of Arctic sea ice over a typical year (2003 was chosen at random). This post has a video of all years for your confirmation. The near complete melt of Arctic ice can be seen at Day of the Year ~250 and latitude 72. 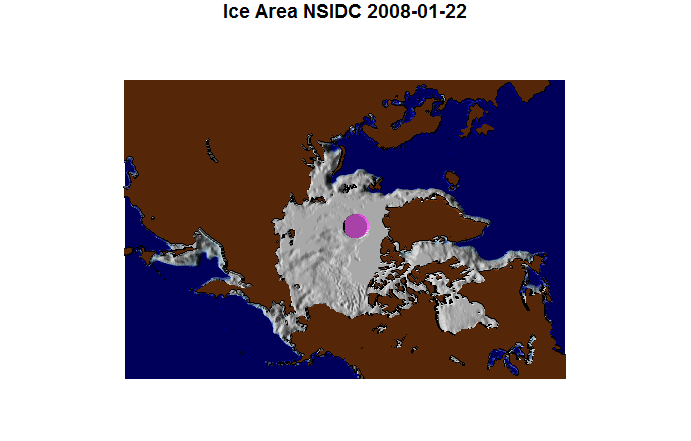 The red dot below indicates the visually approximated time and latitude of maximum melt. So I masked off and ignored all of the data north of 72 degrees representing basically the only multi-annual sea ice on Earth. This assumption corresponds to all of the ice outside of the bright green circle in Figure 3 below. Notice that there is a lot of Northern hemisphere sea ice to the South of this circle. James Stafford contacted me by email to ask me to call attention to his interview with Judith Curry. Dr. Curry and I share different views on something. I’m not sure what that might be, but this blog was cut from her blogroll during my critique of the BEST paper confidence interval she coauthored. She had not replied to me on the matter of BEST for months until recently when she said the team was probably too busy with other things but was considering it. Anyway, I suspect that my politics may be the issue because in my opinion the IPCC never had a useful role in that it was designed from the beginning to do exactly what it is doing. Her opinion is common but in my view, it takes a little political naivete to think the IPCC could ever have been anything except what it is. Readers do not generally like to hear things which sound absolute. There is no discussion then. They prefer endless pedantic discussion along the lines of, ‘well if we just had openness’…. In reality, Climate Science funding would diminish under open operation and that is a means to an end I would like to see, but I prefer to write what is on my mind rather than what is most effective at achieving some goal. Readers may even prefer to hear – well it used to be ok but now it might be bad. Imagine how much fun we could have with that thread! In my opinion, the massive bulk of Climate Science simply cannot afford the change in operation of the IPCC but will be forced into it. They desperately need the center of authority to maintain their money-bloated consensus agenda but my made up global political computer model is predicting some lean years ahead for the fat cats of climate. Still, I think readers will enjoy the article, there is plenty of meat in it and it should make for some good discussion. Also, it looks like she may be up to answering some questions at her blog. 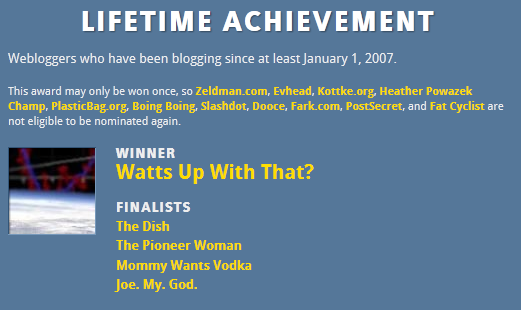 Skeptic Weblogs Sweep Global Award Categories – This one is on the readers. This is more than a little telling about the basic state of climate science. Images below are copied from Anthony Watts site. In case you are wondering whether the public is buying into the constant attacks on scientific skeptic blogs by the main stream media and overpaid government scientists. Congratulations to everyone below, especially WUWT for the huge achievement. Also congratulations are due to the large numbers of interested readers who are scientifically able to parse the politicized scatology so prevalent in climate science from the reasonable parts. It gives me hope that reason will prevail over propaganda. When Steve McIntyre mocks you, you screwed up. Anthony Watts provided the correct link. Extremists in congress have chosen to investigate Heartland institute for discrediting mainstream science. These powerful people who distribute billions of dollars to promote left-wing environmentalism are quoting hundred thousand dollar figures to Heartland in a letter full of innuendo. Like the genius coverup of climategate, I suppose we are too stupid to see through this one? If you have ever looked into funding of climate change, finding the total dollars is nearly impossible. Crossing several billions of dollars in funding takes only minutes though. I put a LOW but fake number up for the government side. Look at that massive Heartland funding in comparison. I have been debating whether to post this email exchange with the NCSE. In light of the recent Gleick burnout, it seems worthwhile. Readers will recall that I posted on Gleick’s attack on conservative political candidates on behalf of his tax-free 501c3 company. Advertising for or against any political party is illegal activity for a tax-free company in the US (although it is a far too often broken rule). Rarely though, has the attempt reached the magnitudes of Gleik’s letters. Considering that most of his company money comes from taxes taken from business owners, the political aspect of his organization is hard to swallow. I hope to turn him in for tax law violation as soon as he files in 2011. The NCSE (National Center for Science Education) had focused in the past on evolution science. Something which I think most of us agree. I don’t want to get into “belief” here as this is a settled item in my mind and the focus of different blogs. Still, there are corollaries between evolution and climate science. Both are highly politicized due to individual ‘belief’ rather than science. My point on the matter is that NCSE was on the apolitical side of evolution. Still, they attracted leftist leaders based on the atheist appeal of the science. These leaders failed to recognize that climate science has the same problems as evolution – except in the opposite direction. Now you may disagree about evolution but this thread isn’t about my opinions on religion. It is about a warning I gave to the NCSE on the extremism of Peter Gleick — well before his recent flame out. It’s official: NCSE is now stepping into the climate change arena. We’re expanding our mission and we’re expanding our web site. What follows is our official release, links to our new mission statement, a video introducing NCSE and our new initiative, links to an exclusive excerpt from “Merchants of Doubt”, and more. Stay tuned: more announcements coming this week! Qs? Want to interview executive director Genie Scott or our new climate change policy director? Let me know! I was surprised at the contact. * Help parents, teachers, and others fight the introduction of climate change/global warming denial and pseudoscience in the classroom. * Act as a resource center to connect teachers, scientists, and policymakers with the best information available. * Provide tools and support to ensure that climate change is properly and effectively taught in public schools. * Aid those testifying before local and state boards of education, and before local, state, and federal legislative committees. * Connect local activists with one another, and with scientists and other relevant experts. * Dr. Peter Gleick, president and co-founder of The Pacific Institute, joins NCSE’s board of directors. Gleick is a noted hydroclimatologist, an internationally recognized water expert, and a MacArthur Fellow. Gleick’s research and writing address the critical connections between water and human health, the hydrologic impacts of climate change, sustainable water use, privatization and globalization, and international conflicts over water resources. * Mark McCaffrey, a long-time climate literacy expert, joins NCSE as climate change programs and policy director. Previously at the Cooperative Institute for Research in Environmental Sciences (CIRES), McCaffrey helped spearhead a number of climate and energy literacy programs, and the creation of the Climate Literacy & Energy Awareness Network (CLEAN), and testified before Congress about climate and environmental education. politicized public-polarizing and flat extremist left wing policy. insanity of his publicly stated anti-industrial political positions. Evolution is a strong science with traceable evidence from many paths. The Peter Gleick story continues on. An anonymous reader left a link to a Washinton post examiner article indicating that the FBI has been contacted on the matter. Whether they react may be the subject of a “high level directive” at this point. The only people who compare this to Climategate are those sold on the Mannian “cause”. This was an activist, committing fraud, alleging snail-mail reciept of a document which I fully believe he wrote, who was caught pretending to be a Heartland board member to gain access to any document he could which would put them in a bad light. The liberal press had joined in the chorus full bore, despite the lack of damning evidence like “hide the decline” and now has failed to retract or apologize for any of it. The Chicago-based free market Heartland Institute has called in the FBI and threatened other legal action against a global warming proponent who has admitted stealing emails from the institute in a bid to embarrass and discredit the group’s questioning of climate change. Heartland officials tell Washington Secrets that they have been in talks with the FBI over the case against prominent global warming proponent Peter Gleick, co-founder of the respected Pacific Institute. Heartland is getting ready to reveal their probe of the affair, which they hope the FBI will act on. The media bias on this matter has reached new levels. I’m thinking Gleick is on the Christmas list this year. While everyone watches in awe as comet Gleick smashes into the Lunar bedrock, I have returned my tired head to the sea ice data. We are slowly stepping toward an improved understanding of sea ice melt here. To that end I have been working on improved graphics. In my long-term self employment, I have programmed a wide variety of data visualization softwares. In all cases, the software was of a far lower level than R code. I am an engineer and creation of robotics, vision systems, and fast statistics packages in the past, were written from scratch. Often, these displays plotted individual pixels, vectors or planes to display 3D objects/surfaces as they were morphed and rotated, but due to the low level nature of the display, my control was complete. In R, the display code is pre-written and the challenge is to figure out the limitations and abilities of the functions. Below is another re-hash of the sea ice video. However it is rendered in what I call pseudo-3D, in that some basic shading is present. I found the shading contrast created a far more intuitive visualization than my previous work. The view is top down, but is 3d and can be rotated off of this visual axis by adjusting parameters which give it a 3D mountain effect. IMO, the best angle was top down. Please note the differences in the spatial noise frequency as the video progresses. The limitations of the sensor system may be greater than I understood. You can see instantly that the difference in noise level is not minor by any means. The good news is that we seem to be improving in our ability to measure. The bad news is that it could make for lousy trend analysis. I have created a video below but the frame rate is a little fast. I will improve it later but it takes several hours to complete the process. Lucia’s thread is particularly interesting on the matter. UPDATE, WUWT — Heartland replies to Gleick and calls him out. A leading defender of climate change admitted tricking the libertarian Heartland Institute into turning over confidential documents detailing its plans to discredit the teaching of science to school children in last week’s sensational expose. Ouch!! It looks like there is more to come. During the followup to the Heartland institute document release, some bloggers had deduced that government funded activist Peter Gleick had a hand in the mess. His 501C is powered by government taxpayer cash, which is fine, except that he is an activist which uses the money to fund political messages in complete violation of IRS code. Today at Dot Earth, Gleick shed his pseudo-science cloak. Andy Revkin, fellow activist, has posted Gleick’s admission of his malfeasance. Now a bigger activist than Gleick is hard to come by, Tamino is in his category but only just. I am completely baffled as to why these people receive credibility while reasonable scientists don’t. This guy is so far over the top that nothing he writes, thinks, expresses or publishes should be taken without serious context placement. Yet he is a ‘premier’ voice in environmental science. Steve McIntyre has an excellent and detailed breakdown of the Heartland documents which like Climategate, again exposes the false arguments of the politically motivated press. If you want your climate news with honesty, blogging has become the premier source. – By default. Sea ice by latitude video. 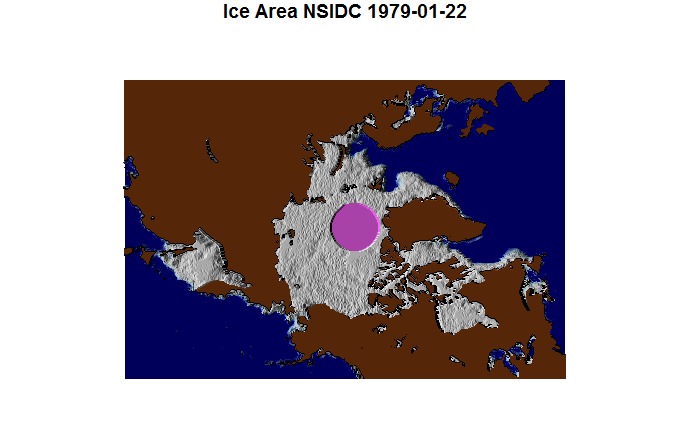 Layman Lurker was able to use online tools to establish that the only perennial sea ice exists above about 72 degrees latitude. This leaves a small 18 degree circle at the north pole for the multi-year sea ice to exist. I wanted to confirm this fact before moving on with an analysis of trends in multi-year ice vs perennial. If we parse the sea ice data at this latitude we can get a better idea of what the sea ice ‘death spiral’ is comprised of. Anyway, many on the previous thread wanted a video of the plots but the early sea ice years had missing data (every other day) which didn’t agree with R’s plotting function. I have interpolated (linearly) missing data and created the same plots as shown previously in a continuous manner for the existing data. So in the vein of the Heatland institute funding of Anthony Watts denier intent to put already online temperature data online in a user friendly format, here is another user friendly anti-science video of online data from the NSIDC. – Sorry couldn’t resist. I’m not sure the best way to present these results but I’ll start with just the photos. 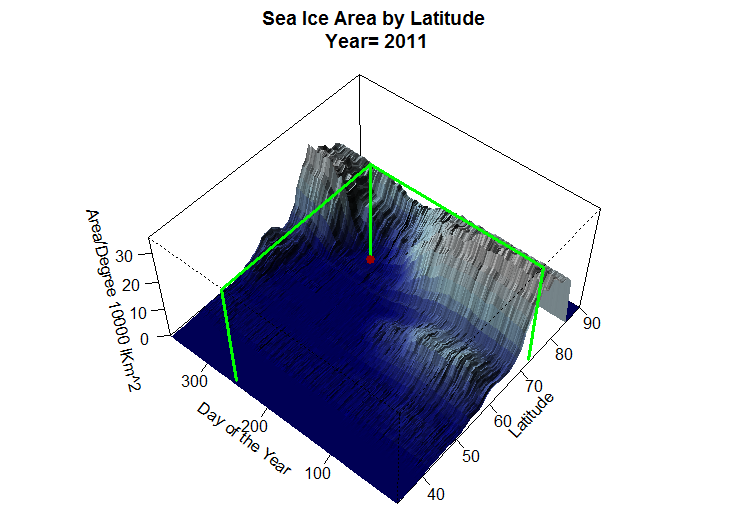 I was curious how the sea ice looked by latitude band. We know from previous posts that there is a minimum sea ice level which contains some noise bias. This post shows sea ice area in each degree of latitude band by area for each day of the year. I suppose I’m old enough not to be surprised by the behavior of the media anymore, but this garbage coverage of the Heartland scandal has done it again. The media has flatly ignored that the point of the funding for SKEPTICS was to put the temperature data on line. That’s it!! Put it up where people without a computer background can plot it, see it and understand it. How is that nefarious or anti-science in any way? I’ll answer – it isn’t! You don’t have to wonder why blogs exist and why Fox News is taking over the news market. People want information, not distortions. Every article I run across has the same tone, the same ‘gotcha’ punch lines about skeptics and the poor naive scientists who were misrepresented in Climategate. They feed this garbage to the public in droves and wonder why their ad revenues drop like stones. It isn’t the paper or internet which is killing the media, it is what they put on it. So when it is shown that the ‘primary’ leaked Heartland document with the main message is a complete forgery, where are the media reporters now? Where are the retractions? How about a simple investigation of the headers? In the same place that the nefarious act of publishing the NOAA temperature data is. In the circular bin or the janitorial closet of the New York Times where it won’t see the light of day. There is no need to apologize to conservative groups after all, only to groups that push the correct politics like Media Matters or GreenPeace. Even though I am regularly disappointed with the biased media coverage of things like Climategate, this time the unprofessional behavior is pretty special. They are only attacking the report because a small amount of money is being donated to a climate skeptic blogger who just happens to be a weather professional!! There is no attempt by the media to recognize that the money was to be put to use to place the primary data, the temperature data so central to the AGW message, on line. Any motivation on the part of the individual after that should be moot. The media and propaganda blogs like DeSmog should be proud to have the dataset on line and pleased that Heartland would invest that money for the common good. We all should recognize that putting the information on line in a usable fashion, is a strongly pro-science endeavor. When we read media articles about skeptics, they typically paint us as though we are non-technical, uninformed and motivated by our politics over our minds. “Skeptics need to get real, and do something about climate”, they say. This is despite the in-your-face reality that the IPCC represents exactly those political qualities. The truth is that most of us are technical people from other fields who like to discuss the details of the data and many have realized that there just isn’t much to be alarmed about! Climate Science has failed to alarm us. We are chemists, engineers, programmers, physicists, astronomers, medical professionals, meteorologists, statisticians and even climate scientists. We are not the ones who are uninformed in the debate, we are the ones who are qualified to read the science and where appropriate – disagree. Since we are unfunded by the government for climate and often better statisticians, I would even say we are more qualified to judge the science than those embroiled in the highly funded political morass of “getting the world to do something”. See Real Climate blog for a perfect example of the politics behind climate science. We read articles from advocate media every day. They are very consistent, and very wrong about people like Anthony Watts. Not much exposes the bias of Climate Science more than the media-wide unabashed smear campaign against him for doing the right thing with data. I guess I’m still not so jaded that I cannot be surprised. They keep working on it though. The Heartland institute has released a statement on the stolen documents which include funding of Anthony Watt’s temperature project among other things. If you want to see the difference between skeptics of climate change and advocacy groups, this section of the press release pretty well sums it up. If the truth doesn’t agree with your message, make something up. An important story has broken in the mainstream media. Anthony Watts received a 44,000USD pledge to put temperature data on line in an easy to access format. His intent is apparently to make the data easily available to the public. The media reports are centered on the Heartland institute’s donor which pledged the funding of a skeptic. As usual, the leftist media ignores the massive funding on the advocacy side of AGW, instead chosing that this is a real ‘news story’. Even more amazing is that the media, in their wisdom, has failed completely to notice that the project is NOT in any way a “skeptical” one. Anthony Watts is being criticized for his name ONLY in what is an obvious attempt to discredit his efforts and ANY efforts by the Heartland institute to influence the climate debate in any way. Anthony Watts covers his side of the story here. Again, the left biased media unwittingly made themselves the story. You wonder why they have no readership. Lucia at the Blackboard has a similar reaction. Bishop Hill also covered the story.